The first iPad was launched in 2010 and, though thin and light for its day, now has the appearance of an aluminium slab that could easily be weaponised given enough force. With a base price of £439$499, the original iPad was powered by Apple’s A4 chip, which included 256MB of RAM, along with 16GB of flash storage. And while the device, with its 9.7-inch display, was initially mocked as simply being an oversized iPhone, the iPad has since become an essential companion and, in some cases, a laptop replacement for many musicians and audio engineers. As I wrote in the June 2010 issue of SOS, it turned out the iPhone had actually been a small iPad. Eight years after the release of the original iPad, it’s amazing how this product has evolved. Last year, Apple released a new 9.7-inch iPad at the lowest price yet seen for this particular model (£339$329), which was reviewed in the June 2017 issue. This year, at an event focused on education, held in March, Apple announced the sixth-generation 9.7-inch iPad. This new iPad is physically identical to its predecessor, using the same design aesthetic first introduced when the iPad Air launched in 2013. It doesn’t possess the same fit and finish as an iPad Pro, with the most noticeable example being (no pun intended) the display. The iPad lacks the Pro’s fully laminated, wide-colour gamut display with anti-reflective coating; and because it isn’t optically bonded there’s an observable gap between the display and the glass. But this is perhaps to be expected, since the sixth-generation 9.7-inch iPad also lacks the £619$649 price tag of the cheapest iPad Pro. Apple have kept the same $329cost, in US dollars, for the base model, which, in the current economy, translates to a £20 reduction in UK Sterling at £319. This configuration offers 32GB of storage and Wi-Fi; to get 128GB costs an extra £90$100, and cellular connectivity is available for an additional £130$130. 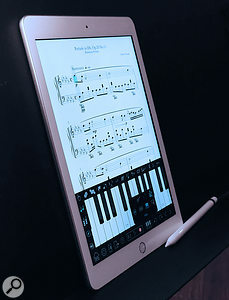 The fifth-generation iPad was powered by Apple’s A9 chip, which first appeared in the iPhone 6s, but this has been upgraded to an A10 Fusion in the latest model. The A10 was introduced with the iPhone 7, and it’s an important change because it offers significantly greater performance than the A9. The ‘Fusion’ appendage refers to Apple’s implementation of ARM’s big.LITTLE architecture, where, of the four processor cores on the chip, two are engineered for high performance and the others for low energy. This enables the system to switch between which pair of cores are used, depending on the apps in use, to optimise power in both senses of the word. 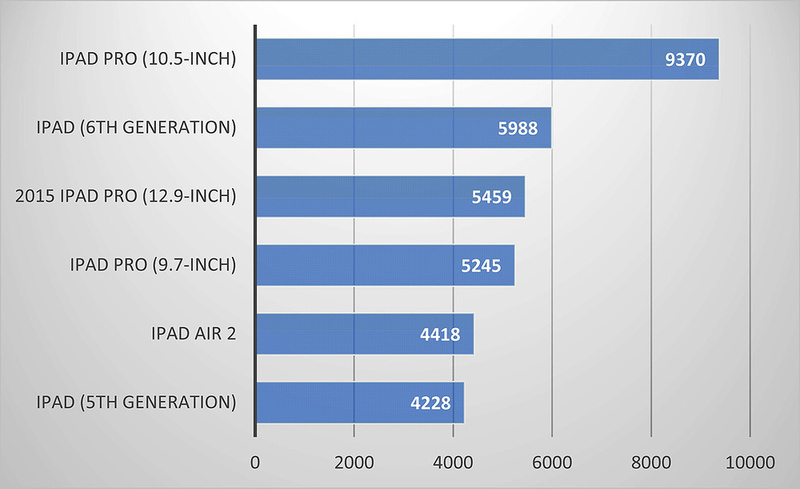 Geekbench multi-core scores for recent iPad models. Running Geekbench, the sixth-generation iPad scored 3512 in the single-core test and 5988 in the multi-core. By comparison, the fifth-generation model scored 2318 and 4228 in the single- and multi-core tests respectively. This puts the new model slightly ahead of the performance offered by the original 12.9-inch iPad Pro when it launched in 2015. To put these numbers in context, I recreated a similar test to the one I performed when reviewing the iPhone 8, which involved running Audiobus 3, with Reactable’s STEPS sequencer feeding into Korg’s iWavestation (and monitoring the CPU usage with Techet’s Status app). The sixth generation hovered around 20-percent CPU usage, compared to the 10.5-inch iPad Pro that used around 15 percent under the same conditions. So in terms of real-world performance, this new, lower-priced iPad fairs pretty well against Apple’s top-of-the-line model. Aside from the improved internals, one of the most significant new features in this new iPad is that it’s the first non-Pro-designated iPad to support the Apple Pencil. Comparing this model with my 10.5-inch iPad Pro, the experience of using the Pencil seemed less slick, and the response was a little slower, though unless you’re an artist (or have both models side by side, as I did) you’d probably be hard-pressed to notice the difference. It’s also amusing to consider that, priced at £89$99, the Pencil alone costs a little less than a third of the price of the entry-level Pad. However, Pencil-compatibility is definitely a welcome addition. 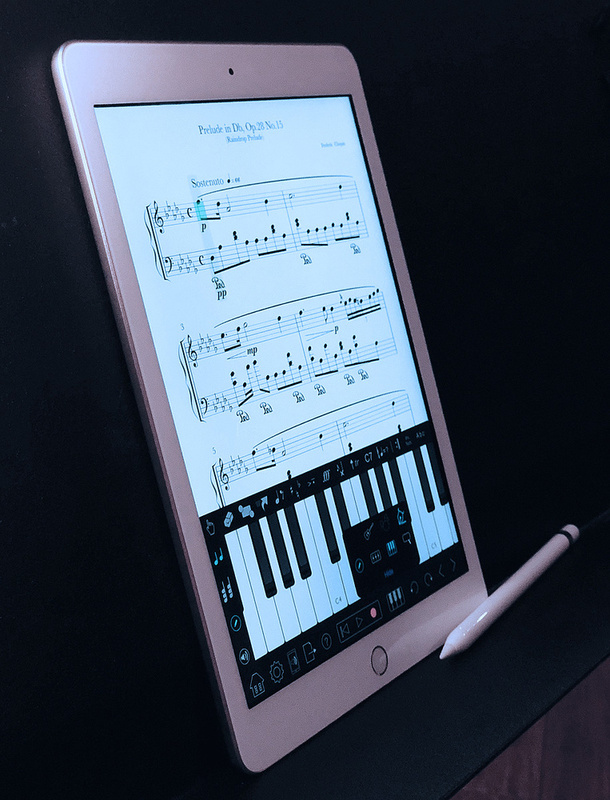 While there isn’t an iOS notation app that’s quite as sophisticated as StaffPad (which takes advantage of Windows’ support for ink input and is downright impressive on Microsoft’s Surface devices), there are still many good notation apps for iOS that offer Pencil support. Notion would be one example, which uses MyScript’s music handwriting recognition technology, as does MusicJot. Symphony Pro also provides some really nice — and perhaps also the best — Pencil-related features. And I remain a true believer that the sort of functionality that the Apple Pencil provides will revolutionise how we interact with notation apps. Apple’s goal with the sixth-generation 9.7-inch iPad was clearly to produce an iPad with great performance at an affordable price. They succeeded. There’s no better tablet you can buy that offers the features on offer for the money. I’ve written this before, and, at the risk of being boring, I’ll write it again. When you look at the app ecosystem, with Moog synths available for less than the cost of visiting Starbucks — not to mention Wolfgang Palm’s contributions and countless others — there’s never been a better time to own an iPad.